I have a question. I have iron in my well water, but my water is also on the acid side (somewhere between 6 and 6.5 I think). This is out at our lake house, and we only used it on some weekends and sometimes more in the summer. I was recommended by our local Culligan company to use a calcite neutralizer followed by their iron filter. Is there one tank or one system that can do both? The home has 2 bathrooms, but it's usually just me and my wife there. Thanks for emailing. Yes, there is a combination Pro-OX-AIR iron filter that has a blend of Pro-OX iron filter media as well as some calcite in it. If you used a lot of water and lived there full time, we might recommend a separate neutralizer and iron filter, but you can save money and space by using the Pro-OX blend iron filter. There are two types of Pro-OX Air systems, the Pro-OX AIR standard system, and the Pro-OX AIR blend which not only removes iron and odors but also eliminates acid water conditions as well. Iron oxidizes (turns into a solid particle) best and most rapidly at a pH range of 7.0 to 8.0. A low pH (less than 7) keeps the iron in solution. Low pH water usually has clear water iron. Aeration helps raise pH because the reason for low pH is typically dissolved carbon dioxide. Translucent tank – easy to see level of filter media. Use the Pro-OX Blend series when your well water pH is between 6 and 6.9. One advantage of the Pro-OX Blend series is that the Pro-OX media lasts for many years, but the calcite dissolves over a period of a few months. This means you can simply add more calcite on top of the more permanent iron filter media. The Pro-OX iron filter media can last 15 to 20 years, unlike other media that must be changed every few years. 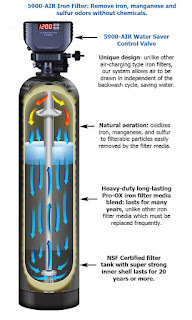 The standard Pro-OX-AIR iron filter removes iron, manganese and sulfur odors through a combination of natural aeration and the powerful Pro-OX filter media. However, all these types of oxidizing iron filters, work best if the pH is between 7 and 8.
pH refers to how acidic or alkaline water is. It is a scale from 1 – 14, with 7 being neutral. Below 7 and the water is considered acidic. Iron Oxidizes (turns into a solid particle) Better and Faster at a pH Range of 7.0 to 8.0. A low pH (less than 7) keeps the iron in solution. Low pH water usually has clear water iron. Aeration helps raise pH because the reason for low pH is typically dissolved carbon dioxide. By aerating the water (adding oxygen) the carbon dioxide is partially eliminated, allowing the pH to rise naturally, although the calcite blend is still recommended if your well water pH is less than 6.9. Pro-OX Calcite Blend Filters works down to pH 6 (If you have less than 6, you are better off getting a separate standalone neutralizer). The tank is equipped with an automatic backwashing valve that periodically backflushes (the opposite direction of the flow) the calcite media to the drain for a few minutes to re-classify the media and remove any precipitated solids and/or iron. In the process of raising the pH in the presence of iron, some iron will precipitate out and needs to be backflushed to remove it.